We purchased this as a Christmas present to go along with a hypoallergenic down alternative comforter and the quality is outstanding. I purchased a similar duvet cover from another site for myself before I saw this. I spent much more money, and this duvet was far superior and much much less than the other one. The material is very soft and durable feeling, and my parents loved the gift! I highly recommend this duvet. Crafted of substantial 200-gsm for warm and durable bedding, these coziest cotton flannel oversized duvet cover sets are offered in a pallette of beautiful solid hues and holiday printed patterns. These incredibly soft and heavyweight duvet sets are brushed multiple times on both sides for softness and includes internal corner ties that can secure your comforter thru its corner loops and prevent shifting. This durable oversized suvet set is machine-washable for easy care. Flannel oversized duvet cover set is perfect for down comforter. 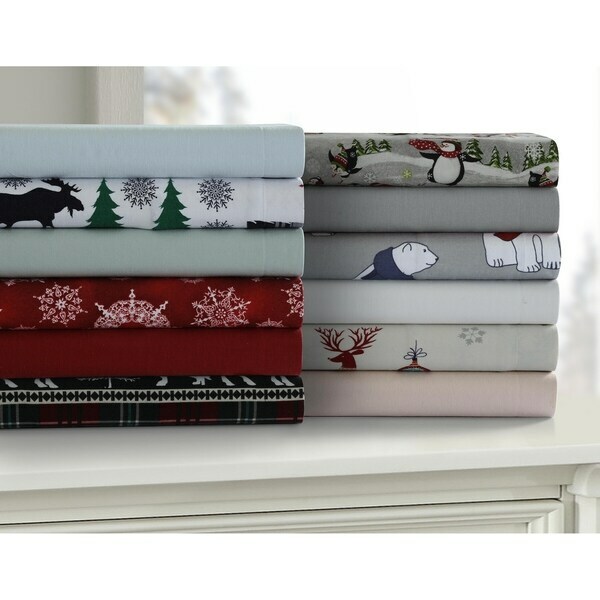 Matches well with flannel deep pocket sheet set for a great bedding set. Very comfortable. Great duvet cover for the cold winter months. I picked the polar bears since they are a favorite of mine and love it. Very cozy for sleeping. Would definitely recommend. Great pattern, thick cotton fabric. It washed very well. This is not super fuzzy flannel, not a lot of nap on it. Very pleased. The shipment is quick. The flannel sheet with rain deer design has very good quality and looks exactly as in the picture. We received a lot of compliments.